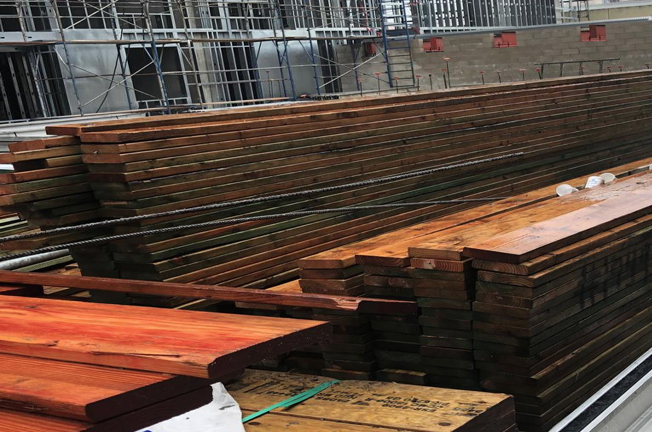 MFI is out to defend builders from wet wood suppliers that are delivering wet wood and not defending it for the builders as it sits around on job sites. The supply chain starts with the producer and they defend themselves in there technicals. It's starts to break down from there on whether is the lumber yard/broker or the framers testing wrap and leaving it not stapled back. Builders should not be held responsible until it’s up and in the building at 19% or less. When lumber is being placed in the building at 30% to 50% moisture content, they are subjecting the builder to radical dry down delays if a building official pulls out the moisture meter to apply the code to the builder. California May have needed water to fill reservoirs but it created big problems for areas hit hard by wild fires with mud slides and big problems for builders with soaking wet wood. LOS ANGELES — A storm soaking California on Wednesday could trigger mudslides in wildfire burn areas where thousands of residents are under evacuation orders, authorities warned. Up to 4 inches (10 centimeters) of rain is expected along the Central Coast, and amounts could be higher in areas where thunderstorms develop, the National Weather Service said. 1) A probe-type or contact-type moisture meter was used to verify the moisture content of the lumber in the building. 2) At least three random readings per room per floor on wall and floor framing members are recorded. 3) Moisture readings were taken at a point 2 feet to 4 feet from the grade stamped end of each piece to be verified. This is national supply chain breakdown coast to coast that needs to be fixed because it’s our builders that need to be protected from lumber brokers and pre-fab shops that are not defending lumber from rain and snow before it arrives on the job site, as well as when it sits onsite. MFire is an advocate for our Renewable Sustainable Resource lumber when it comes to meeting the demands for housing starts with lumber that sequesters CO2. The supply chain wet wood syndrome is only going to feed the concrete and steel carbon producers negative propaganda campaigns, as they do over all the arson attacks. All the solutions to defend lumber from extreme wetting are readily available now to builders. Our Mighty Fire Breaker Program Defends builders from arson attacks of which we have had 5 so far this year and over 20 last year. Our Mighty Mold Defender Program for Builders is very cost effective if the lumber in Buildings is 19% or less per the manufactures specs and the building code. If you are dealing with saturated wood syndrome start drying down now and hire someone to add biocides to all the lumber or you could end up with SBS. Be careful of any mold companies or products that are polymere based with biocides they can cause hydroscopic problems.